Mr.P and I like to go fishing. Mr.P likes the fishing more than me, but I must say, I do love getting a fish on the end of that line. And it feels good when you catch enough fish to take home and cook up for dinner. Or Lunch (ok, so we've only ever managed to catch enough once!). But I do enjoy being outdoors, the sound of the water, the shining sun. It's very relaxing. And quiet if you go to the right place. Lately Mr.P and I have been heading down to Yarramundi, not far from our place, to hang out where the Hawkesbury, Grose and Nepean Rivers converge. There are some really great spots around the area, and there are also LOTS of spots. 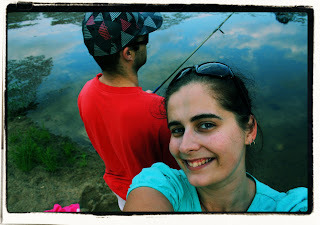 Anyway, on Friday night Mr.P and I went down to Yarramundi and found ourselves a nice palce to fish from. There were only a few other people down there, and they were couples with dogs, letting them get some exercise and swim in the river. We'd been sitting there quietly fishing, not caring really whether we caught anything when along come these two older guys. When I say older guys, I mean they were probably in their early-forties. So not that much older. Anyway, they come over, we think they must just be stopping to chat and see if we've caught anything, but no, they plonk themselves down, right next to us! I'm talking, like, less than 2 metres away!!! Now I'm a friendly person. I don't mind sharing fishing space, having a chat with a fellow 'fisherman', but unless we are on a sea wall and there is limited space, you don't sit down two metres from two people who are fishing, forcing one of them to move, and start fishing away, when there are Three Bloody Rivers with fishing spots you could choose from! I couldn't believe it! Have they not heard of fishing etiquette?!?! Are we the only ones who think that's rude, when there is easily km's worth of river bank you can fish from, we weren't even that close to the carparks and everything, we'd walked a fair way, that they would come and sit so close to us? And to make matters even worse. They then preceded to pull in tiny little mullet. We'd just been getting nibbles and then they start pulling them in. Granted they were only little fish, but it just made the situation more annoying. Eventually we got up and walked around to find another spot. Didn't have much better luck (I only caught a Turtle that trip, poor litle guy!) but it was the principle of the thing. You don't go and plonk yourself down 2 metres from people who are fishing and then go throwing a line in yourself when there are a million other spots to choose from. Fishing etiquette people, fishing etiquette! Indeed. Find another spot people. You are absolutely right!! You know what I really love? When you find a spot and the fish just keep biting...not that it happens very often. And, do you actually take the fish off the line by yourself? I just can't do that! I so agree!!! Similar thing happened to me and my boyfriend when camping. We had set up our tent in an enormous camping area and this father and son decided to set up right next to us when there was so much room. It wasn't as if we were close to anything either! We moved and there was an incident with an open back door and a tree...but lets not go there! When you do outdoor things naked people usually don't get too close. @Ronnie - I know what you mean. It's only ever happened a couple of times (I once caught three bream in 10mins before Mr.P even got his line in the water. He was not happy, esp coz the fish then went off the bight!) and it always feels so good pulling them in. And no, I don't take em off the hook, that's Mr.P's job. He usually baits my hook for me too. I can do it myself, but the argument is why should two of us have to get fishy hands, I need to drive home! @Mia - Well, I had been contemplating stipping down to my undies to have a bit of a swim, but them showing up stopped that. Maybe I have should have?